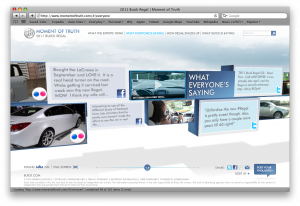 www.momentoftruth.com—Buick on the cusp of a marketing breakthrough! How many times have I sat in meetings with manufacturers and discussed the need to get consumers engaged with their brand in the digital space? Too many times to count and the concerns are always the same. What if they say things we don’t like? What if they say something untrue? What will they expect of us? How will we respond? Inevitably the lawyers weigh-in and the reasons “why not” stack up like cordwood. So I think it noteworthy that Buick has found a way to get beyond the reasons “why not” and to give consumers an uncensored voice regarding the new Buick Regal at www.momentoftruth.com. This is a terrific website with tons of information from a variety of sources, the company, general media, buff books, blogs and real consumers. The use of Twitter and Facebook feeds, Youtube videos and Flickr is terrific and makes the site feel very credible. The net effect is that you feel as if you’re getting a chance to see the entire body of opinion regarding the new Buick Regal in one stop. GM is using technology that searches the web for mentions of the Buick Regal, aggregates it, edits out the profane and posts the rest. The result is really fun and full of interesting commentary. It’s not quite a dialogue with consumers but it’s a step in the right direction. I admit that I had to wade through a lot of positive comments to find the few negative ones, but they’re there. Good for Buick, maybe the reality is that most of the response to their new vehicle is positive! Last weekend, I did something I haven’t done in recent memory…I went to my local Buick dealership. I’ve read good things about the new Lacrosse and I wanted to see it for myself. The dealership had one car. It looked terrific. The salesman said that it was “more European in its styling” and I agree with him. No land yacht here. My one gripe was the “portholes” on the hood, if that is a Buick styling cue, it’s one they should let go (one man’s opinion). Regardless of the “portholes,” it was hard not to be impressed by the car. If the 2010 Lacrosse is indicative of where they are taking the Buick product line then I’m already thinking about the brand a little differently. As impressive as the product was, that was not the most interesting part of the dealer visit. I asked if I could drive the car and was politely told, I’d have to “wait my turn.” People were lined up to drive the new Lacrosse! The best news…they weren’t all 65 and older, quite a few were 10-15 years younger. Based on one dealer visit and the crowd around the 2010 Lacrosse, perhaps the Buick brand is going to surprise us.